A Pond Skimmer is the heart of the Ecosystem Fish Pond Filtration System. A Pond Skimmer pre-filter is where your filtration begins. 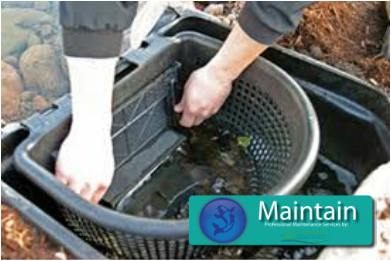 The low maintenance pond skimmer is designed to sweep the surface of the water so the fish pond is free from debris and collected in an easy-to-remove access basket . The debris basket inside the skimmer is the first filter stage of the skimmer. The basket will collect leaves, twigs, seeds, and other debris that falls or blows into the pond. Here in Northern New Jersey (NJ) (Long Valley, NJ - Morris County) it only takes a few minutes every other week to empty the debris basket. The pond skimmer basket will require more frequent attention during the fall months because of the quantity of leaves falling off the surrounding trees. If you're using an Aquascape Pond Skimmer now, chances are you love it! !